I mentioned a few weeks ago that Cottontails was to become the exclusive UK stockist for two new Moulin Roty ranges, and I'm delighted to report that the stock has now arrived. Two huge boxes were delivered a few days ago and it was instantly exciting to spot 'Cottontails own range' scribbled onto the cardboard! I feel rather proud that we have developed such a close relationship with Moulin Roty that they entrust us with these exclusive toys, and we'll do our very best to promote them in the UK. In fact, I think I can feel another competition coming on...! 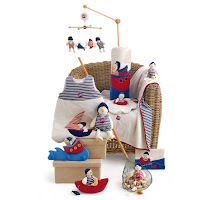 The ranges are based on two new characters - Martin le Lapin and the Petit Sailor. I've included a couple of pictures here, but I think each character really deserves a post of his own!